For millions of young professionals, CASHe is the answer to life’s unpredictable financial needs, with loans ranging from INR 10000-200,000 disbursed within minutes, for 15, 30 ,90 & 180 days. That’s why we describe CASHe as your stitch in time. Social Loan Quotient - Get approved…even without prior credit history. A brand born in a digital world, serving millions of digital Indians must offer something truly unique. That's what we set out to accomplish at CASHe. We are all part of a giant digital community and our digital presence is imprinted in multiple ways. This digital footprint of ours literally defines how we exist & behave in the social world. This is what drove our research scientists to develop an advanced credit ranking system using big data analytics, AI and predictive tools to calculate Social Loan Quotient (SLQ) of our customers. Conventional lending agencies and banks work on out dated systems that rely more on your past financial transactions. We are interested in your today and how that will impact your tomorrow. SLQ’s revolutionary approach changes the way credit-risk is calculated. It is linked to a number of data points including mobile and social media footprint, education, monthly salary and career experience. SLQ is a dynamic score and as you interact with us more and spend time in the digital space your SLQ score evolves too. Raman is a successful tech entrepreneur and private equity investor. He is the founder & former Chairman/CEO of NASDAQ listed M*Modal Inc, a leading voice recognition, healthcare document technology company that he took from a start-up to until it was sold to One Equity Partners for over a billion dollars in 2012. Since then, he has actively invested in a number of ventures across India, Middle East and USA. He is also a limited partner in three large international private equity funds. He recently joined the board of THub- one of India’s most successful tech incubator and accelerator. 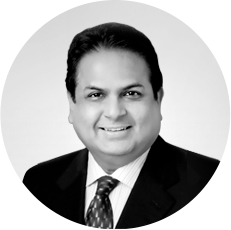 Raman was Ernst and Young’s Entrepreneur of the Year 2007 award winner for Maryland, USA, and was also honoured with Maryland International Leadership Award by World Trade Centre Institute, Baltimore in the same year. 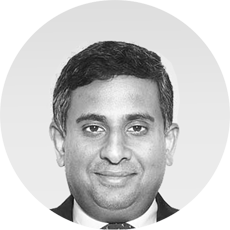 Raman is currently the chairman and managing director of Aeries Technology Group and CASHe is his latest venture. 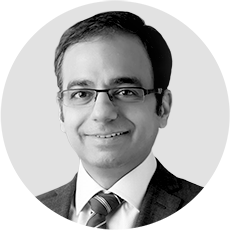 Sudhir is a Chartered Accountant with more than 20 years’ experience in finance. He was the global controller of CBaySystems (M*Modal) from January 2007 until March 2011. 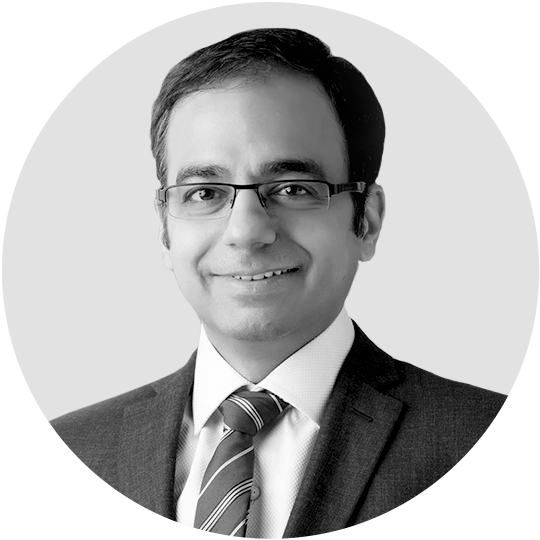 Prior to that he was a senior partner at Chandabhoy & Jassoobhoy, a reputed accounting firm where he specialized in audit, M&A advisory, corporate structuring for large clients in banking, finance, mutual funds, capital markets, securities exchanges, manufacturing, technology, BPO / KPO sectors. He is currently CEO of Aeries Technology Group. 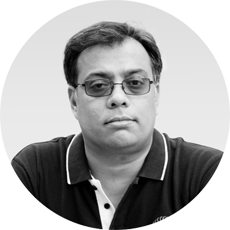 Dr. Pulak Ghosh is Professor of Quantitative Methods at the Indian Institute of Management Bangalore (IIMB). Prior to Joining IIMB, he was a Professor at the Georgia State University and Emory University, Atlanta, USA. He was also senior associate Director for Novartis Pharmaceuticals, USA. He has a PhD, MSc., BSc in Statistics. He was named as the "top 10 most Influential Analytics Leader" in 2015 and was the only academician in the list. He was recently rated as one among the “5 most influential Indian data scientists “by Tec radar. His rise from Assistant to Full Professor in mere 8 years is widely considered in the top 5 fastest in the history of Statistics, Analytics and Marketing globally. Dr. Pulak Ghosh is currently serving in the Advisory group of Big data at the United Nations (UN) Global Pulse, a big data initiative by UN and the knowledge commission of UNESCO-MGEIP. He is also an academic fellow at the Center for Advanced Financial Research and Learning promoted by Reserve Bank of India. He is also a senior fellow at Niti Aayog – Data Analytics Cell. He is advising several companies on analytics and big data. Based on his outstanding and innovative contribution to Statistical application, the International Indian Statistical Association awarded him with the Young Scientist Award” in 2011. Mathew Cyriac most recently was the co-head of the private equity business at Blackstone Group, the world’s biggest private equity and alternate asset management firm. Under Mathew, Blackstone scored one of its best exits in a decade when it sold a controlling stake in cash management company CMS Info System to Barings Asia in 2015. Before joining Blackstone in 2006, he served as the Head of Corporate Development and Strategy at iGATE Global Solutions. Mr. Cyriac also served as the Chief Financial Officer of Quintant Services, where he led financing and other strategic transactions and its eventual sale to iGATE. He was a Vice President in the Investment Banking Group at CSFB, for two years, where he led several equity and debt offerings, and merger and acquisition transactions. Mr. Cyriac also worked in the Private Equity Group at Donaldson, Lufkin and Jenrette for over four years. He worked in the Investment Banking Division at Bank of America and in the Engineering Division of Tata Motors. Mohan, who holds a B.Sc in Electrical Engineering from Imperial College, University of London, a B.A. from Yale University and a Ph. D in Economics from Princeton, had earlier held the position of Deputy Governor of the Reserve Bank of India September 9, 2002 to October 31, 2004 and July 2, 2005 to June 10, 2009. During the period 31 October 2004 to 2nd July, 2005 he was Secretary, Department of Economic Affairs, Ministry of Finance, Government of India. He has held several positions in Government of India and was Chief Economic Advisor, Ministry of Finance, Government of India in 2001-02. 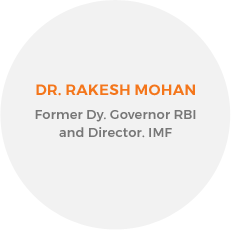 Rakesh Mohan was Executive Director at the International Monetary Fund, Washington, D.C., USA representing India, Sri Lanka, Bangladesh and Bhutan since 1st November, 2012 until recently. 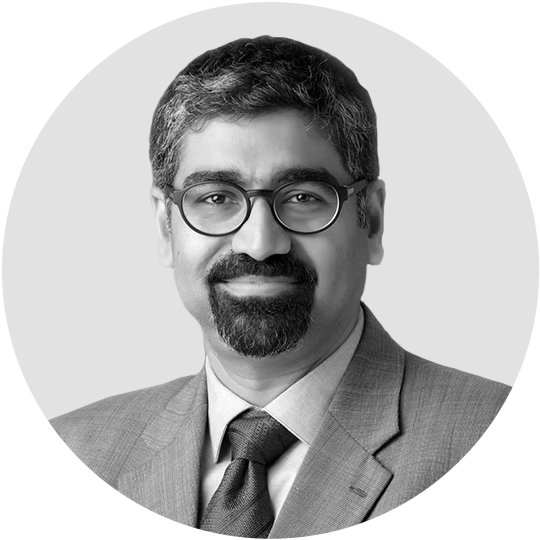 Dr. Rakesh Mohan has researched extensively in the areas of economic reforms and liberalisation, industrial economics, urban economics, infrastructure studies, economic regulation, monetary policy and the financial sector. 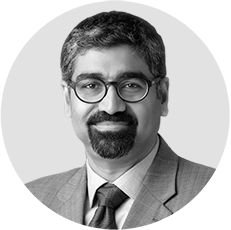 He is the author of three books on urban economics and urban development, co-author of one and editor of another on Indian economic policy reforms, and author of two books on monetary policy and central banking and of numerous articles. 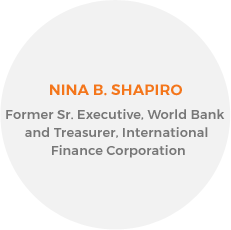 Nina Shapiro has had over 30 years of broad global experience in international and project finance, and business development. She held senior leadership and operating positions at the World Bank and its private sector arm, the International Finance Corporation, including Director of the Project Finance and Guarantee Department, and VP Finance and Treasurer of the IFC. Nina has worked extensively with senior government and banking officials to develop major infrastructure projects and to open domestic capital markets such as China, Brazil and the UAE. In 2010, Ms. Shapiro received the Euroweek Lifetime Achievement Award for contributions to the Capital Markets. Having retired from the World Bank in 2011, she is taking on a full-time role as a corporate and advisory board member. Founder, Chairman & Chief Evangelist. Raman is a successful tech entrepreneur and private equity investor. He is the founder & former Chairman/CEO of NASDAQ listed M*Modal Inc, a leading voice recognition, healthcare document technology company that he took from a start-up to until it was sold to One Equity Partners for over a billion dollars in 2012. Since then, he has actively invested in a number of ventures across India, Middle East and USA. He is also a limited partner in three large international private equity funds. He recently joined the board of THub- one of India's most successful tech incubator and accelerator. 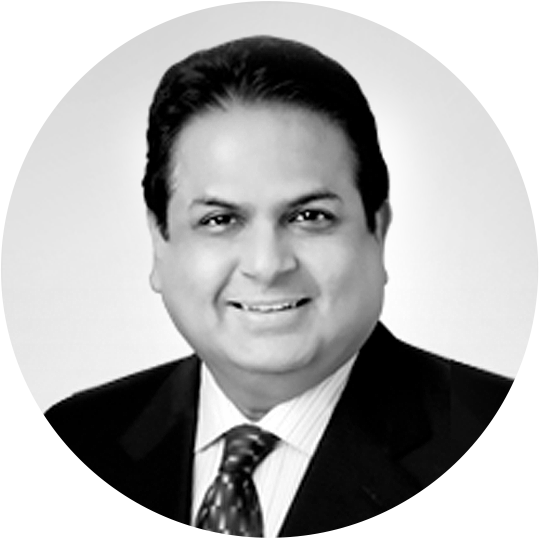 Raman was Ernst and Young's Entrepreneur of the Year 2007 award winner for Maryland, USA, and was also honoured with Maryland International Leadership Award by World Trade Centre Institute, Baltimore in the same year. Raman is currently the chairman and managing director of Aeries Technology Group and CASHe is his latest venture. 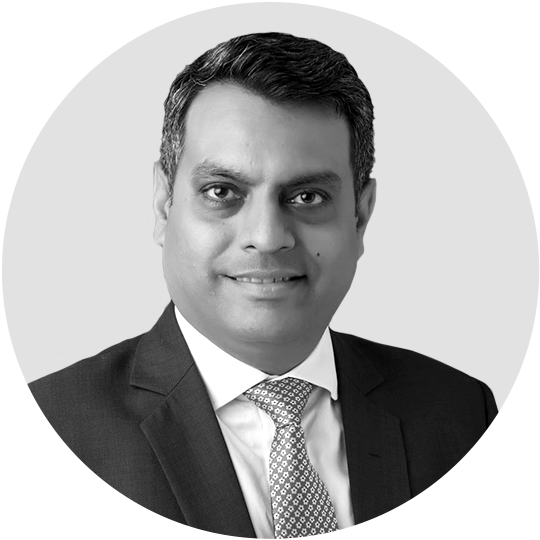 Ketan Patel is the Executive Director and CEO of Aeries Financial Technologies and the Managing Director of Bhanix Finance and Investment Ltd., the NBFC arm of the company. 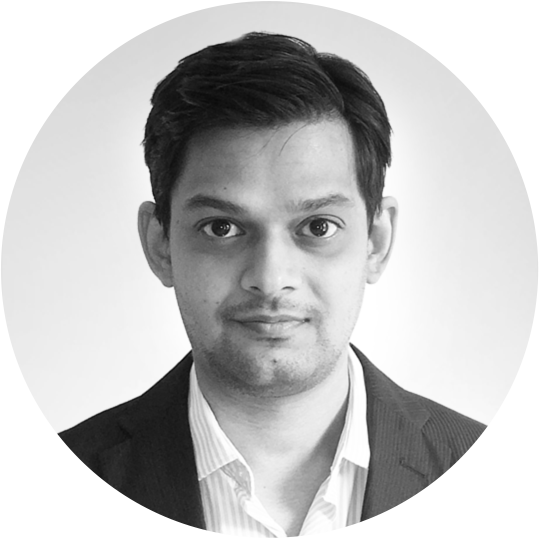 As the Executive Director & CEO of CASHe, Ketan will have the full responsibility for leading the company through a strategic transformation by driving innovation and accelerate its operational excellence that delivers best-in-class customer service and making CASHe India’s largest digital lending company for the salaried millennials. 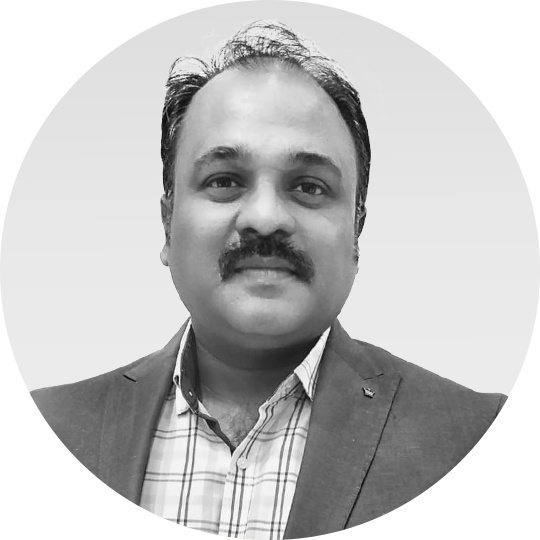 Ketan is a seasoned leader with a proven track record of bringing in operational excellence, accelerating innovation and achieving revenue and profitability in business. 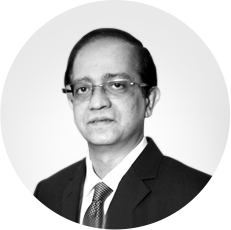 Prior to Joining CASHe, Ketan served Kotak Mahindra Bank for over 18 years where he had an illustrious career heading some of its key portfolios ranging from private banking and most recently, headed it’s Composite Business Solutions and E-commerce vertical. In his role as the Head of E-commerce at Kotak Mahindra Bank, Ketan oversaw setting up a dedicated vertical for the fast-growing E-Commerce business out of the bank’s Corporate Banking Vertical. Throughout his successful career at Kotak Mahindra Bank, Ketan led key business units including Kotak Securities, Mortgages, Kotak Wealth Management and headed its division focusing on NRI business. From 2010 until 2015, he helped setting up the Private Banking Business for the Kotak Group in the UK. 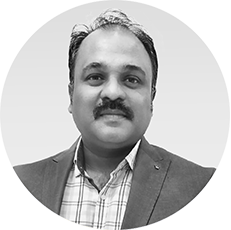 Unni Nambiar is a technology leader with 27 years of industry experience building Enterprise, cloud and & Mobility products across diverse verticals. Unni is currently the Group CTO at CASHe, a leading mobile app based alternative short-term lending platform in the Fintech space that uses Machine Learning based Credit Models and Distributed Ledgers with Smart Contract based Digital Tokens. Along with being the Executive Partner – Technology at CASHe, Unni is also the Chief Technology Officer for Aeries Technology Group, a bespoke offshore technology, consulting and services firm. Unni was previously, the Chief Technology Officer at CBaySystems (later M*Modal Inc.) - a leading voice recognition and healthcare documentation technology company. At CBay, he was responsible for the global technology vision, product engineering, technical support and infrastructure management. Unni is a foodie, loves reading and is an ardent space buff. Pushpinder heads the overall Operations and Customer support team at CASHe. She has over 9 years of experience in Banking & Financial institutions. 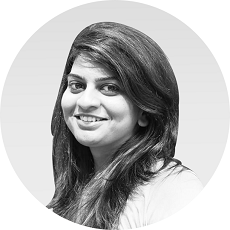 She has hands on experience in handling Credit, Sales, & Analytics. 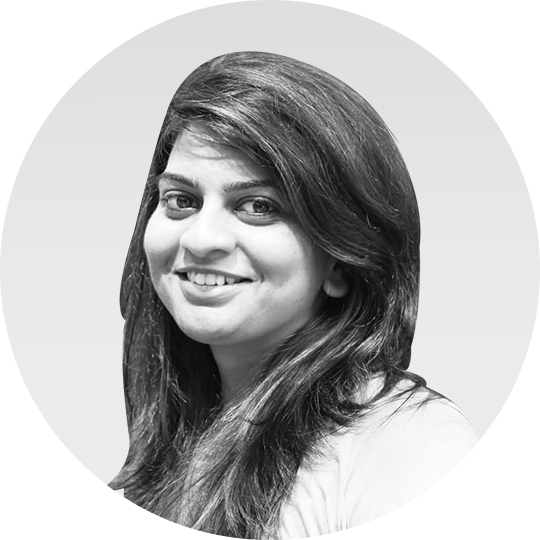 She has worked with organizations like Tata Capital, India Infoline, Capital First & Standard Chartered bank. She holds a MBA in International Business. 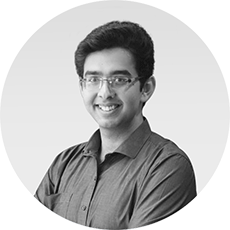 Yashoraj heads the Artificial Intelligence & Business Intelligence at CASHe. He drives its research, development and deployment of key AI systems on its lending platform. 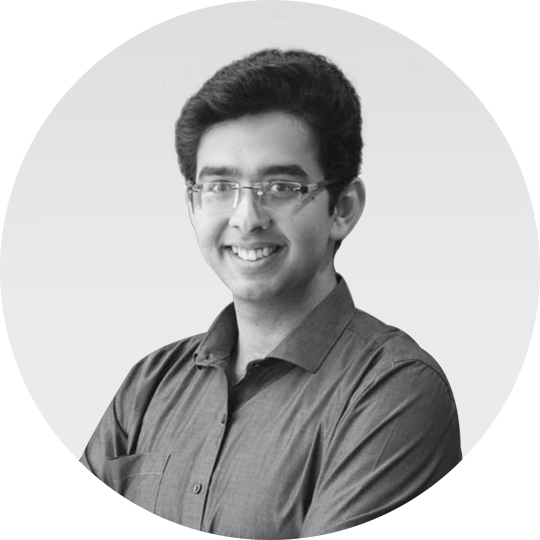 Yashoraj leads a highly talented team of Data Science geeks that work continuously towards deriving actionable customer insights and business intelligence analytics to help the company make strong data-driven decisions. As a Visiting Scholar at UC Berkeley, he has been involved in carrying out extensive research in behavioral finance and AI. A BITS Pilani alumni, he has also been associated with NGOs so as to as to help them work on data-driven societal initiatives such as prevention of gender based crimes. Yashoraj is an avid reader and loves anything science fiction. He likes to follow contemporary international diplomacy and is an aviation enthusiast as well. 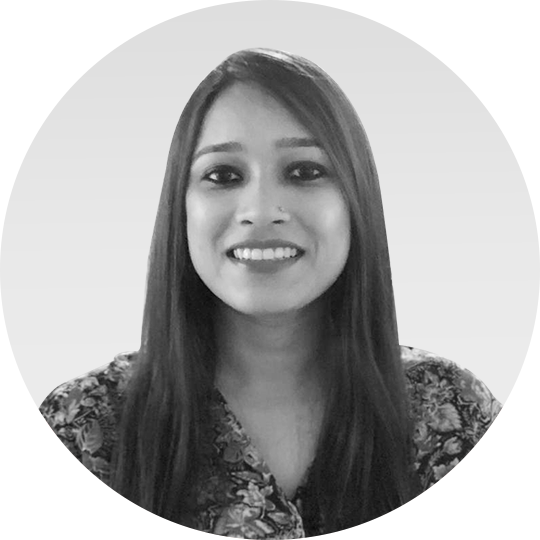 Komal is responsible for leading CASHe’s strategic alliances and for developing innovative enterprise-level initiatives for driving business growth. She leads a team of growth-hackers to ensure planning, executing and maintenance of large-scale business partnerships. 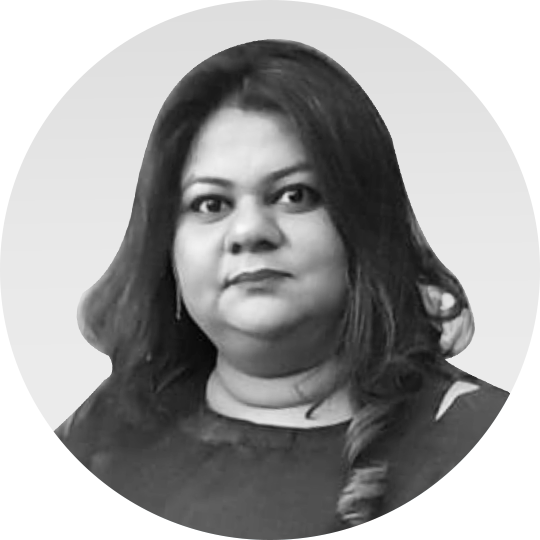 She comes with a rich experience of 16+ years in Corporate Sales, Strategic Partnerships and Alliances, Business Development, Revenue Generation, Clients Relationships, Customer Support, Event Management, also across the Entertainment, E-commerce and Fintech sectors where she has helped business grow rapidly – which includes businesses like Zee Entertainment, BookMyshow, FreeCharge, among others. 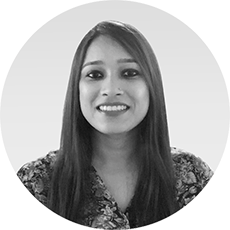 Nayantara heads new initiatives and products at CASHe, a role in which she is responsible for leading her team through the entire lifecycle of product development from inception through execution. She also drives alliances with cross-functional partners to develop and deploy innovative financial products. 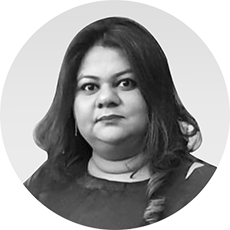 Nayantara comes with a diverse background in multiple sectors like fintech, ecommerce and banking, where she has worked in leadership roles across verticals like growth, partnerships, treasury, trade, structured product development and execution. Prior to joining CASHe, Nayantara was working with Kotak Mahindra Bank Ltd in its Corporate Liabilities Group, Corporate , Institutional and Investment Banking division. 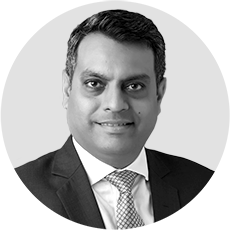 Rishikesh has over 15 years of experience in Collections Management with leading Banks, NBFC and Telecom operator managing Retail and corporate portfolios including Personal Loan, SME, Mortgage, Business Loans, Credit card , Vehicle Loans and Enterprise Mobility. In his previous role with Fullerton India, he was the Regional Collections Manager – West, managing both secured and unsecured products. Armed with masters degrees in AI from UCL, University of Edinburgh and Heriot-Watt University UK. Parnil specialises in Neural Computation, Genetic Algorithms and Natural Language Processing. A passionate advocate for integrating scientific advancements in AI to real world challenges, Parnil has been working in the field of AI for the last 13 years. Parnil is building the artificial intelligence led credit rating system for CASHe called SLQ. Apart from this, Parnil is also an avid reader and a physics and astronomy enthusiast. He passionately follows advancements in dark matter and deep space astronomy.